Madrid, July 20, 2018. IE Business School today held the graduation ceremony for the students of its MBA, Masters in Finance and Master in Management programs. In the course of the ceremony, the Prime Minister of Lebanon, Saad Hariri, was awarded the IE University Medal in recognition of his commitment to promoting economic development and consolidating the democratic system in Lebanon. The keynote address was delivered by Gillian Tans, CEO of Booking.com. Saad Hariri has led the Future Movement Party since 2005. He served as Prime Minister of Lebanon between 2009 and 2011, and last May he was given the mandate to form a new government following parliamentary elections. He has received many international distinctions, including that of “Legion d’Honneur” awarded to him in 2007 by then French President Jaques Chirac. “It’s an honor to award Saad Hariri the IE University Medal as a mark of our respect and admiration for the commitment he has shown to promoting economic development and consolidating the democratic system in Lebanon,” said Santiago Iñiguez de Onzoño, President of IE University. IE University currently has 69 Lebanese students on campus, and more than 350 Lebanese alumni. 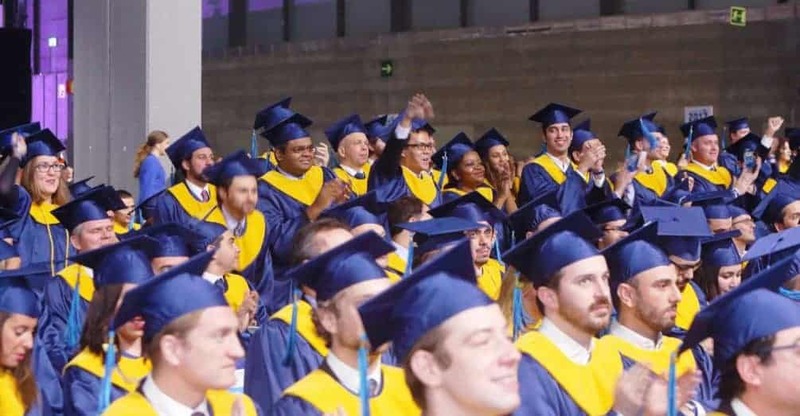 After the medal was presented to Saad Hariri, Gillian Tans, CEO of Booking.com, gave the keynote address for the IE University graduation ceremony. “Whatever you do after today, bring a global perspective to your work and to your life. Think globally” said Tans, who has held the position of CEO of Booking.com since April 2016. “Thinking globally ignites curiosity, breaks down stereotypes and tears down borders, facilitates understanding and perspective, encourages inclusion and acceptance of diversity, forces you to think big, changes the world and is imperative for the well-being of society and the integrity of humanity”. Tans is responsible for global strategy and operations at Booking.com, which has over 15,000 employees working in 198 delegations located in 70 countries, and which registers some 1.5 million room nights on a daily basis.